WCLT - Nature Notes 9/12/2014 - Pink moths? This pink moth – the primrose moth – often hides in plain sight during the day in yellow flowers of common evening primrose, a native wildflower that blooms along trails and roadsides at this time of year. When you think about moths, chances are that you picture drab night-flying creatures – dull white, tan, gray, or brown – that aren’t very noticeable whether it’s day or night. But not all moths fit that image. Some are quite colorful – even pink. For instance, take the primrose moth (Schinia florida), which you might find at this time of year. You might spot this pink moth during the day, hiding inside a yellow blossom of our native common evening primrose (Oenothera biennis), which blooms along the sides of roads and trails. If a blossom looks pink instead of all yellow, take a closer look (or suggest that kids walking with you go check out all the primrose blossoms they see). You might also find a primrose moth among the moths that come to an outdoor light. Not surprisingly, the primrose moth is known as a flower moth (Schinia). Its immature stage is a small green caterpillar that feeds on the buds, flowers, and especially the seed capsules of evening primrose. The adult moth often rests in common evening primrose blossoms, pollinating them in the process. 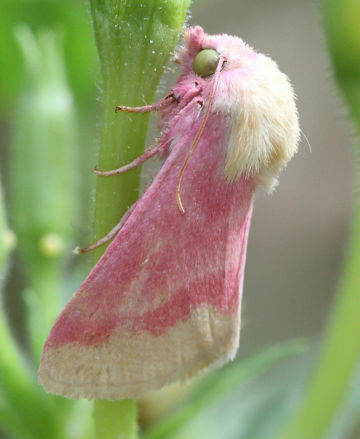 Pink might not seem to be a good camouflage color for hiding in yellow flowers, but the pale yellowish-white wing edges help this moth blend in. If you like the idea of a pink moth, you (or your kids) might want to be on the lookout next summer for another pink moth that’s fairly common. It’s the rosy maple moth (Dryocampa rubicunda). As the name suggests, its caterpillars feed on maples, including sugar maples, red maples, and silver maples, and oaks. The adult rosy maple moth doesn’t eat. It has colors similar to the pink and yellow of the primrose moth, but its patterning is different. Its pink wings have a wide creamy-yellow stripe down the middle (not at the edges of the wings like the primrose moth has). It’s also larger, with a wing span of up to 2 inches. This moth also comes to lights, so look for it around your outdoor lights, usually from May through August. There are also a few other moths with pink coloring. Moths and butterflies are related, but moths are far more common. Moth species outnumber butterfly species by about 10 to 1. Both moths and butterflies have four life stages. They start out as eggs and go through a caterpillar stage (which spends its time feeding on certain plants and growing), a stage when the caterpillar makes the amazing transformation into a flying adult, and the adult moth or butterfly stage (which lives to reproduce). Primrose moths lay their eggs on buds of evening primrose, and rosy maple moths lay their eggs on the undersides of maple leaves. How can you tell a moth from a butterfly, especially if you find a colorful winged creature during the day? One way is to take a close look at the antennae if you can. Moths generally have antennae that are feathery or thread-like. Butterflies, on the other hand, have clubs at the end of their antennae. In any case, let’s appreciate the flowers and insects of September, before the natural world treats New England to the grand display of color that ushers in the season of winter dormancy. To read about evening primrose, look up the 2006 Nature Notes column about it.